Today I would like to briefly show you some random Hanbok pictures I took recently. 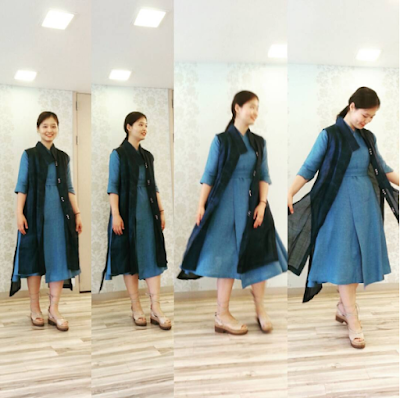 Jeogori (저고리) is the basic upper garment of Hanbok. 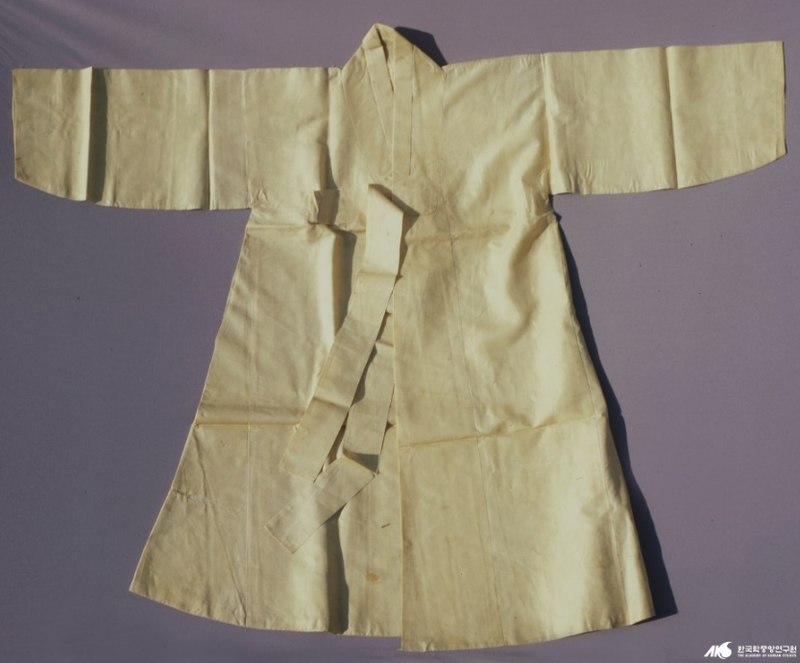 It is worn by both men and women, and Koreans use various types of fabric and a wide variety of colours to make jeogori. For more information, please refer to the wikipedia page on jeogori here. This gorgeous jeogori is one of my favorites! 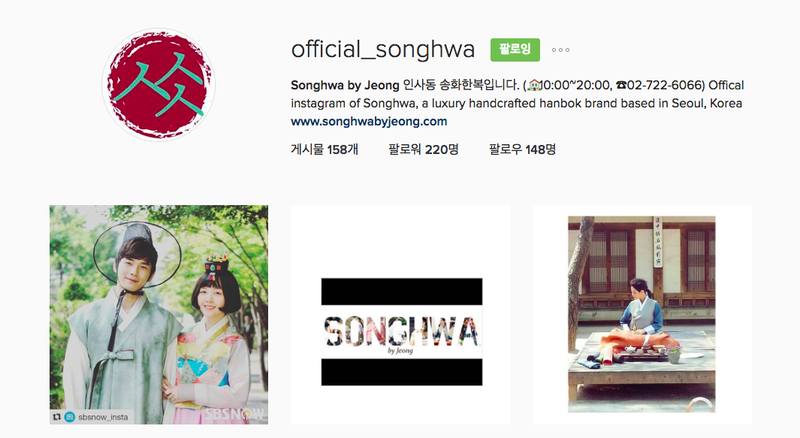 I bought this one from Songhwa Hanbok, a luxury handcrafted hanbok brand located in Insadong. The picture on the left shows me in Songhwa hanbok shop - look at all those colourful, amazing Jeogories! 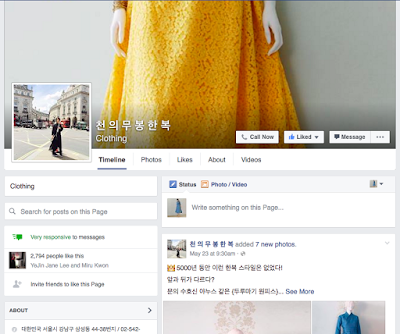 Chima(치마) usually means dress or skirt in Korean. 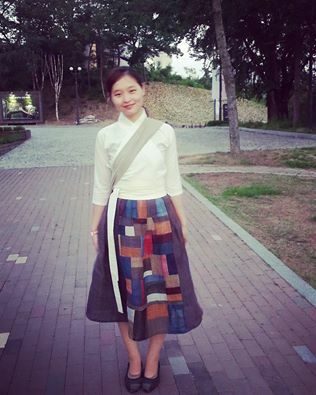 In Hanbok terms, Chima is a type of skirt worn with the Jeogori. 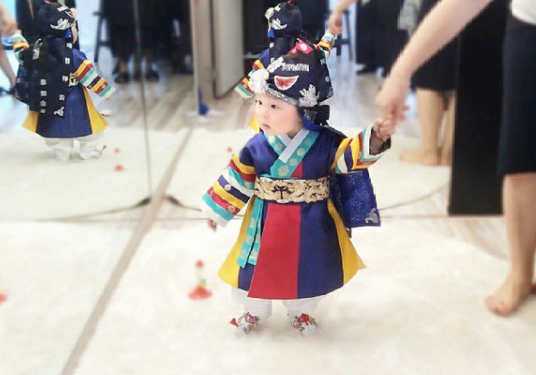 Again, like creative people anywhere else around the world, Koreans make all sorts and colours of Hanbok Chima. 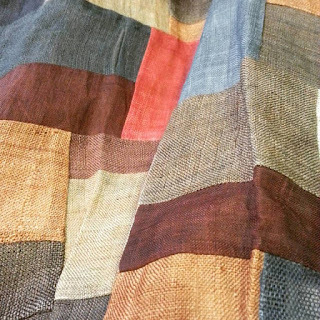 My ancestors seemed to have been very fond of Jogakbo(조각보) (a type of traditional Korean patchwork), just like many people in the West like quilting. Songhwa by Jeong 2015 S/S Collection. 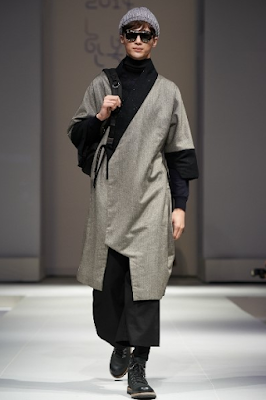 Jogakbo(조각보) Moshi(모시) waist skirt. 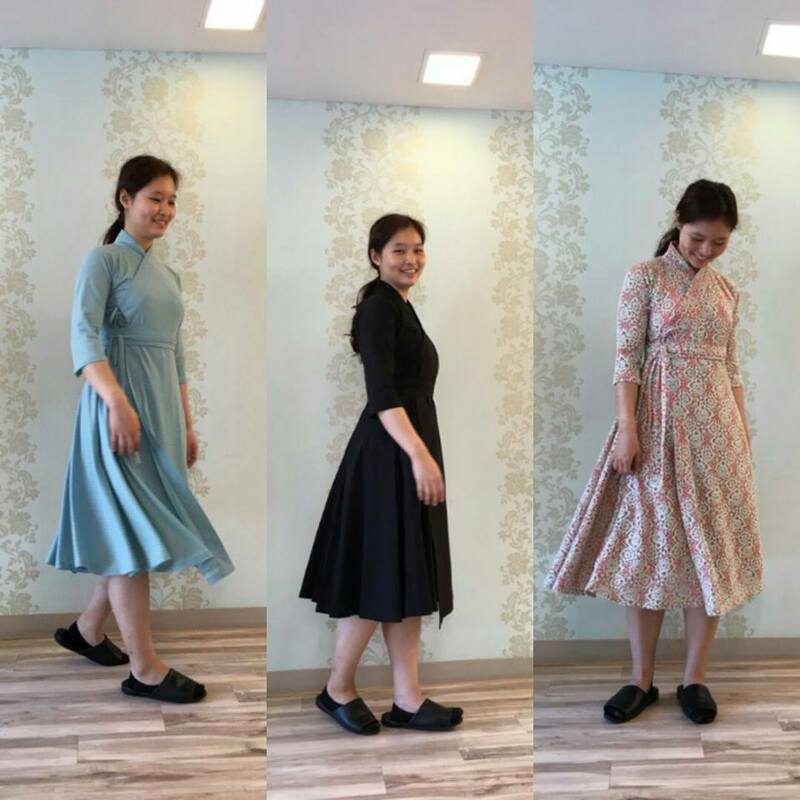 The width of the Chima is usually very wide, which is very different from Kimono of Japan or Qipao of China. Although I also like Qipao and Kimono, Chima gives me more leg-space and allows me to walk in wide steps. 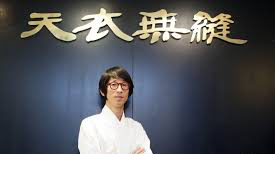 Whenever you are considering buying a new Jeogori or Chima, it is necessary to think about how they would match - just like any other clothes on earth! I usually look at the balance of different colours. If the Jeogori is plain or single-coloured, I would pick a colourful, patchworked Chima to even the plainness out. When I want to wear my Andongpo Jeogori, the one I introduced above, I would choose to wear a plain single-coloured skirt, most likely a red one, to match the sleeves of the Jeogori. 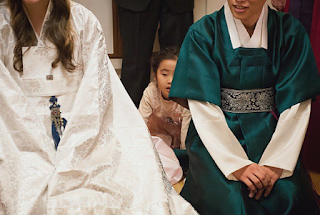 Most Koreans used to (and still do) look for Hanbok for their wedding or the first birthday of their children. 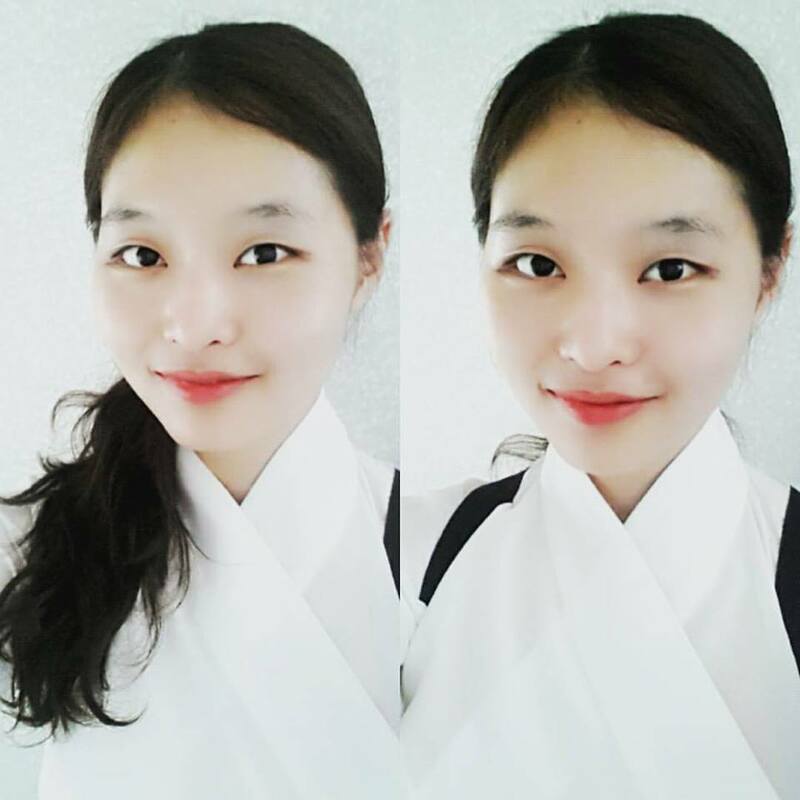 As I have mentioned before, Hanbok was seen as boring, uncomfortable, and too unpractical for daily wear. 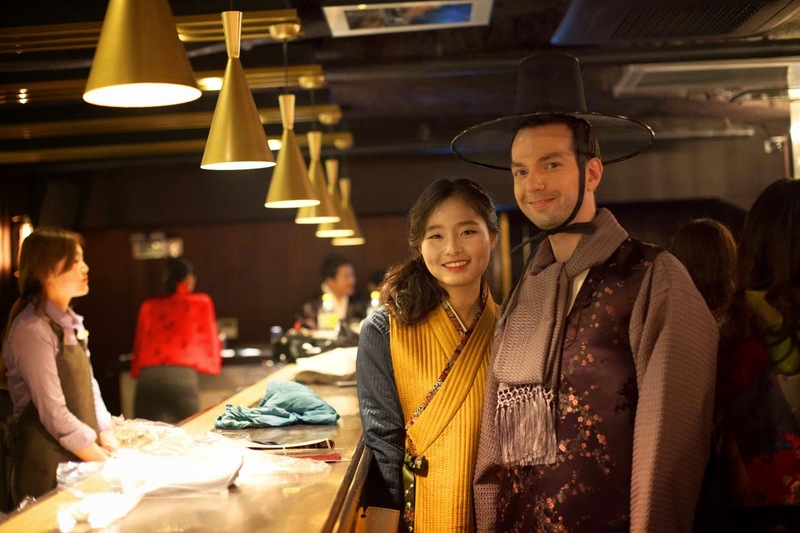 People would only wear them on New Year's Day(Seolnal, 설날) or Chuseok(추석) and preferred western style clothes over Hanbok for everyday life. For more information on Dol, please visit here. 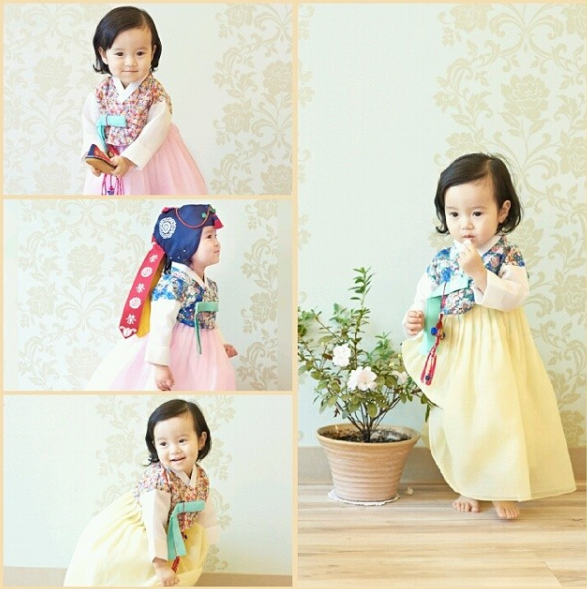 However, as more and more young Koreans see Hanbok as the new hip, Hanbok designers are attempting to sync the tradition into the 21st century. Making Hanbok with modern garment makes it easier and less costy to wear, and now people who don't have at least one or two Hanbok are considered not trendy. 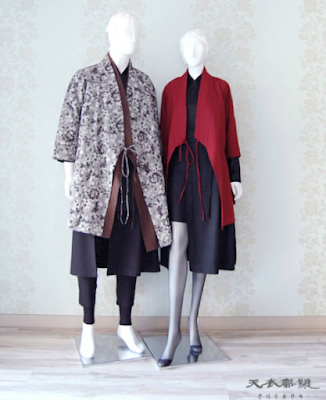 Cheonuimubong is one of the hot Hanbok brands among young Koreans who want to both show off their trendiness and their national identity. But it's not only for Koreans; in fact, I have took several expats in Korea and they simply loved the clothes of Cheonuimubong. So, what can I find in Cheonuimubong? 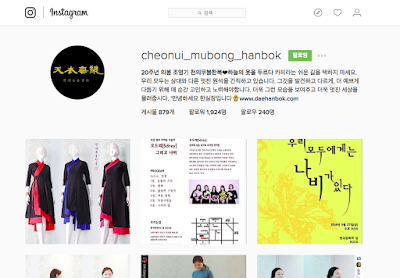 Cheonuimubong is a high-quality Hanbok (Traditional Korean clothes) design shop. Here you may find ready-made modern type well-assorted Hanbok, and if you are into more traditional types you may also place an order after consultation and get a tailored Hanbok. Cheonuimubong is located in Gangnam area of Seoul ("the" Gangnam as in 'Gangnam Style') between Seonjeongneung(선정릉) station exit 2 and and Samgsung Jungang(삼성중앙) station exit 1. From either of the two exits, walk straight out until you see a Kyochon Chicken (교촌치킨), and change your direction into the ally and walk 2 more blocks. You will find Cheonuimubong on your left. Please note that an appointment should be made prior to your visit. Inquiries can be made over the phone, but you can also reach them through Facebook message, on which they always reply in several hours. How can I find them online? Cheonuimubong updates images of new products and customer reviews on their Facebook and Instagram accounts. While their official website is in Korean for now, I hope they expand their activities abroad in the near future. Today I would like to introduce you to my favourite Hanbok (traditional Korean clothes) shop in Seoul, Korea. Hanbok was once seen as the uncomfortable, outdated and old-fashioned 'nanny' clothes. But now, it has become the new fashion trend among many young Koreans. 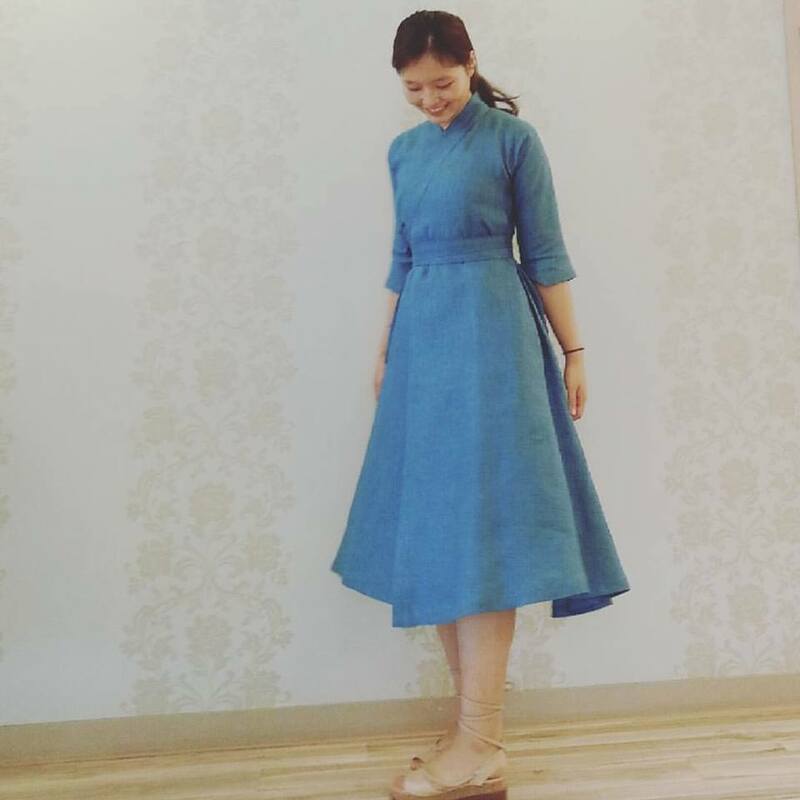 Cheonuimubong is one of the most popular brands for these young Hanbok-lovers, well-known for their high-quality and relatively low price, simple but beautiful design, along with their usage of unique, modern materials. The name of the shop, 'Cheonuimubong', is translated as 'seamlessness' or 'seamless as a heavenly garment' in English. It originates from the chinese idiom '天衣无缝', which is used to describe something flawless that is done with immaculate skill. 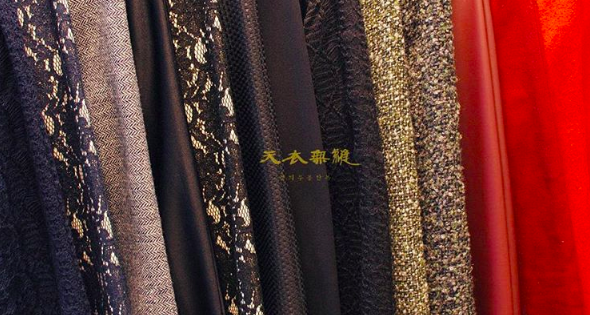 Ancient folks in Asia believed that the clothes of heavenly beings needed no seams, since it was perfection itself. You may find the full story behind this idiom here. 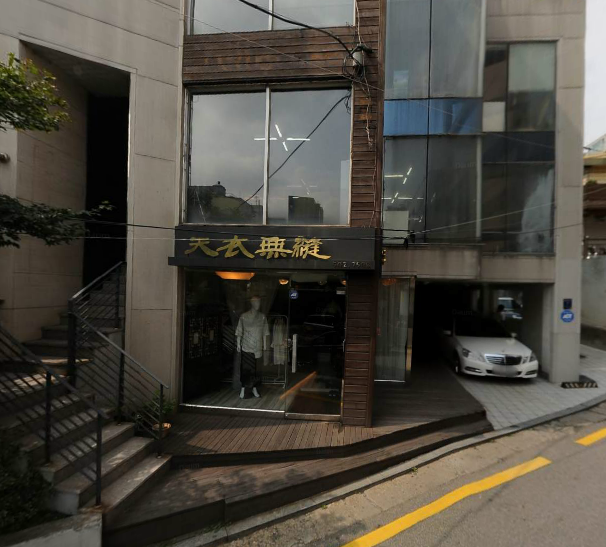 Cheonuimubong is located in Gangnam area of Seoul, which is probably one of the busiest (and richest) areas in Korea. You may find their website here. Hand-made with Italian linen - so soft and comfortable and pretty! 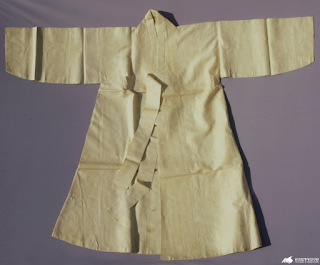 'Durumagi(두루마기)' is a traditional Hanbok coat that looks like this. 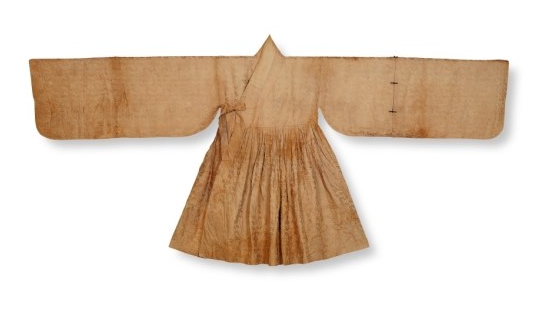 The interesting thing about this item is that it combined the Durumagi with 'Cheolrik(철릭)', which was traditionally worn by military officers - a very unique attempt to bring tradition into modern times, creating a beautiful one-piece by combining two different types of traditional coats! I will write more about Cheolrik in the future, since Cheolrik-inspired one-piece is played a major role in bringing Hanbok into young Koreans' lives. You could also wear a vest on it! 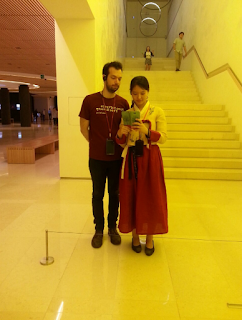 Hello and welcome to Hanbok Dubok, Korea's Hanbok treasure-hunters! 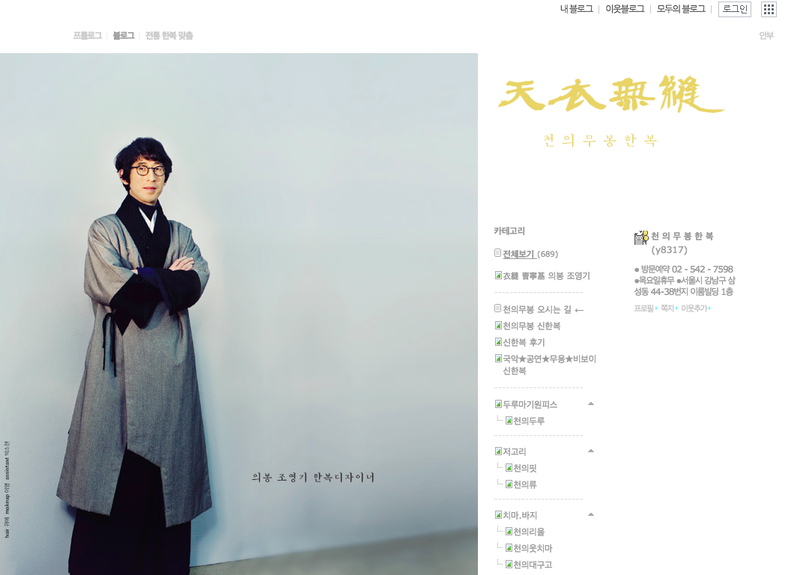 Hanbok Dubok is a blog dedicated to Korean Traditional clothes (Hanbok) and culture. 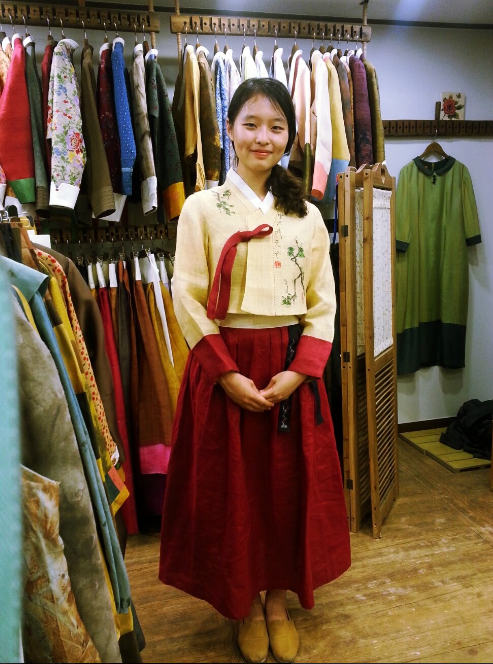 We are interested in traditional costume as well as 'Modern Hanbok'. 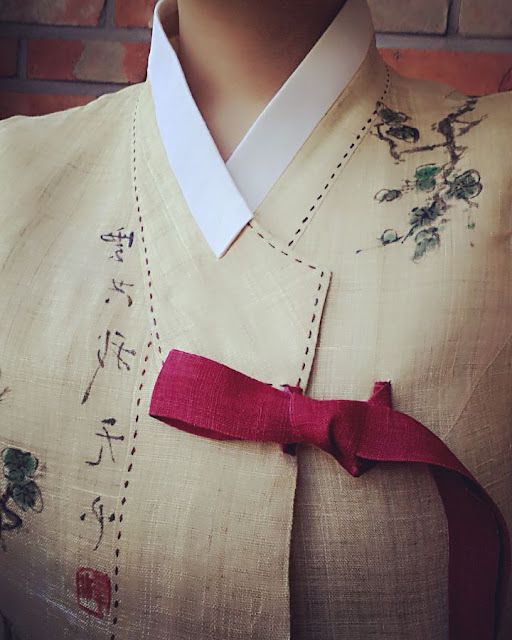 Even though the focus of this blog is on traditional Korean clothes, we will post often about traditional culture and art in modern Korea (and the world). Enjoy! 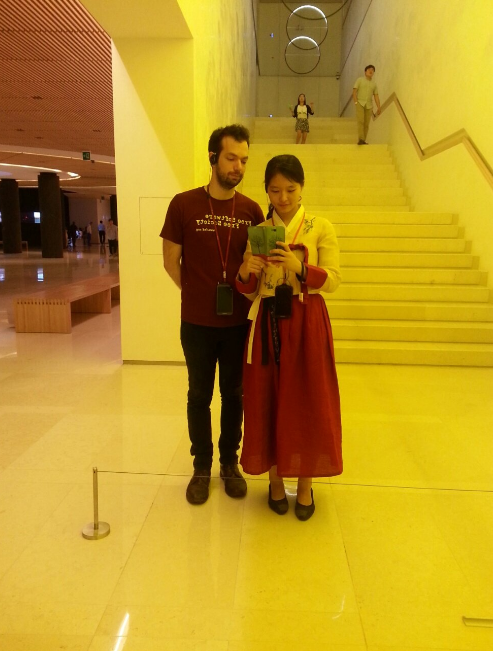 We are two lovers of Korean / Asian culture. Here you will find information on things we see and do in Korea, especially related to Hanbok.